CHARLOTTE AMALIE, U.S. Virgin Islands Tropical Storm Rafael is lashing the eastern Caribbean with heavy rains that are expected to unleash floods in the region. The storm was located about 85 miles east of St. Croix in the U.S. Virgin Islands at 8 p.m. EDT Saturday. It had top sustained winds of 50 mph and was moving north at 12 mph. 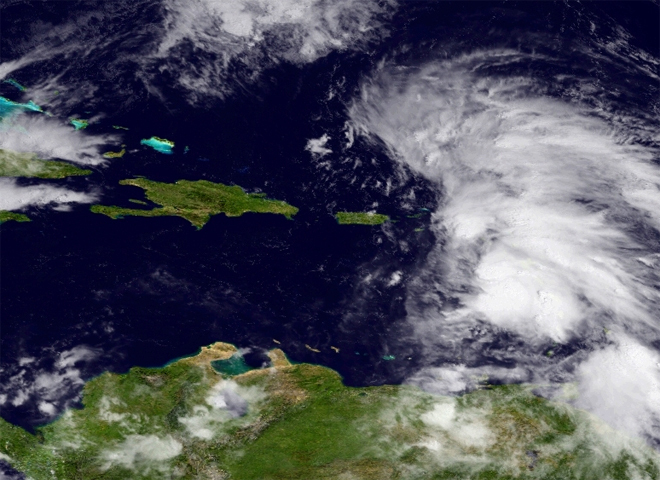 The U.S. National Hurricane Center said the storm will gain some strength and could become a hurricane by late Monday. Its center will pass near or over the Virgin Islands Saturday night, with the storm turning toward the north-northwest on Sunday. As a result of the storm, Cape Air and regional carrier LIAT cancelled flights Saturday scheduled to leave from Puerto Rico's main international airport. The Carnival Victory cruise ship also cancelled a stop in St. Maarten on Saturday. Flooding was reported in the eastern Caribbean island of Trinidad, where the storm caused a brief power outage at the island's main international airport late Friday. At least one flight was cancelled. A tropical storm warning remained in effect for the U.S. Virgin Islands, the British Virgin Islands, Anguilla, Barbuda, St. Kitts, Nevis, Antigua, Montserrat, St. Maartin and Guadeloupe, among other places. Puerto Rico was under a tropical storm watch.